The Geneva Music Festival returns June 1, bringing world-class artists to Auburn and Skaneateles to present classical and contemporary chamber pieces as ensembles and solo performances. Among these are critically-acclaimed violinist Jinjoo Cho; organist Raymond Nagem, associate music director at the Cathedral of St. John the Divine in New York; cellist Clive Greensmith, concert artist and professor of cello and chamber music at the Colburn School; and violinist Ani Kavafian, a concert artist and professor of violin at Yale University. 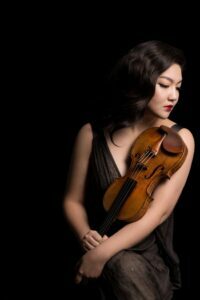 On June 3, 2017, Cho will join other GMF artists-in-residence for “America the Beautiful: Jinjoo Cho and Friends” at the First Presbyterian Church of Skaneateles. They will showcase the wonderful variety of music created in America and feature the music of immigrant Americans as well as the father of American sound, Antonin Dvorak. This concert represents a reunion of Cho, GMF Director and violinist Geoffrey Herd, and violist Eric Wong. “Music from the Heart: Classic and Contemporary” will take place on June 8 at Willard Memorial Chapel, Auburn. Herd, Wong, cellist Max Geissler, pianist Cahill Smith, and violinist Eliot Heaton highlight two of today’s most glorified composers, John Corigliano and Jennifer Higdon, both Grammy Award and Pulitzer Prize winners. Also featured are two of the most beloved composers of the past, Schubert and Saint-Saens. An organ recital by Nagem on Thursday, June 15, showcases the organ of Westminster Presbyterian Church. He will perform his own transcription of Prokofiev’s witty “Music for Children,” as well as music by J. S. Bach, Felix Mendelssohn, Max Reger, and Louis Vierne. In the season’s chamber music finale on Friday, June 16, world-renowned artists and GMF favorites cellist Clive Greensmith and violinist Ani Kavafian return to perform some of the most exciting works of chamber music with GMF founding artists Herd, Heaton and Hannah Collins. The concert, “Slavic Serenade,” at the Presbyterian Church of Skaneateles, features audience favorites, including Dvorak’s Piano Quintet and Shostakovich’s Octet. Founded in 2011 with the mission of entertaining, inspiring and nurturing a lifelong love of music in the community, the festival annually presents artists whose work will appeal to audiences of a variety of ages and musical tastes. The GMF will take place from June 1 through 18, with concerts in Geneva, Auburn, Canandaigua and Skaneateles. Tickets for adult admission to each concert and an after-concert reception are $25 (ages 18 and under are free). Six-concert passes and season tickets are only available until the first concert, in Geneva, on June 1, and may be purchased online prior to or in person at that concert. All venues are wheelchair accessible and air conditioned. A full schedule including details and locations for all concerts, artist biographies and tickets are available on the festival’s website: www.genevamusicfestival.com. The Geneva Music Festival is made possible, in part, by public funds from NYSCA’s Decentralization Program, administered locally by Finger Lakes Community Arts Grants (FLCAG) and CNY Arts, Rochester Community Foundation, Wyckoff Family Foundation, Geneva Rotary, the City of Geneva, Williams Family Foundation, and the Sands Foundation.